The Ranking and Rating list for the coming month shows the following stronger currencies being well represented for going long: USD(4X) with the CAD(4X). The weaker currencies are the AUD(4X) followed by the JPY(2X) with the EUR(2X) and GBP(2X). Some of the pairs in the Top 10 comply for a longer term trade based on the Technical Analysis (TA) of the Weekly and Monthly chart. For the coming month these seem to be: GBP/USD, USD/JPY, AUD/USD, GBP/CAD and EUR/USD. For more details read both of my articles where the relevant Charts and Tables are provided. For analyzing the best pairs to trade looking from a longer term perspective the last 12 months Currency Classification can be used in support. Neutral: AUD, CHF. The preferred range is from 4 to 5. When comparing the 12 months Currency Classification with the pairs mentioned in the Ranking List above some would then become less interesting. On the other hand these pairs are at the top of the list partly also because of their volatility. It seems best to take positions for a short period then and take advantage of the high price movements. With the FxTaTrader Strategy these pairs are not traded because these would be traded in the Daily chart or in a lower Time Frame. Nevertheless they may offer good chances for the short term trader. 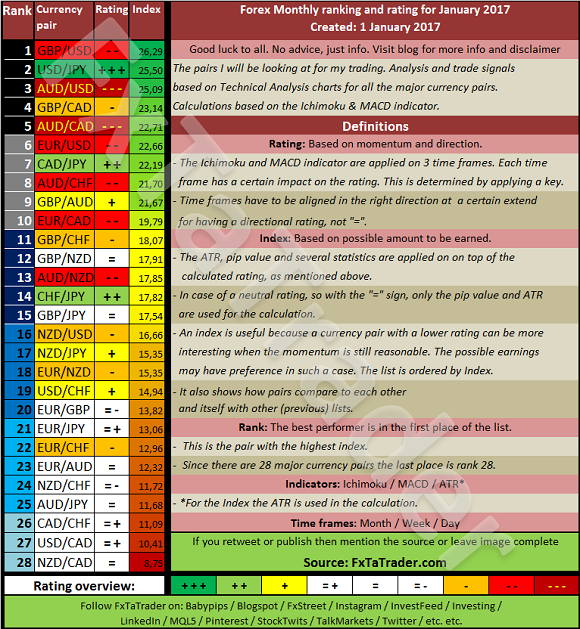 The Currency Score analysis is one of the parameters used for the Ranking and Rating list which is published also in this article. The Currency Score is my analysis on the 8 major currencies based on the technical analysis charts using the MACD and Ichimoku indicator on 3 Time Frames: the Monthly, Weekly and Daily. The result of the technical analysis is the screenshot here below. 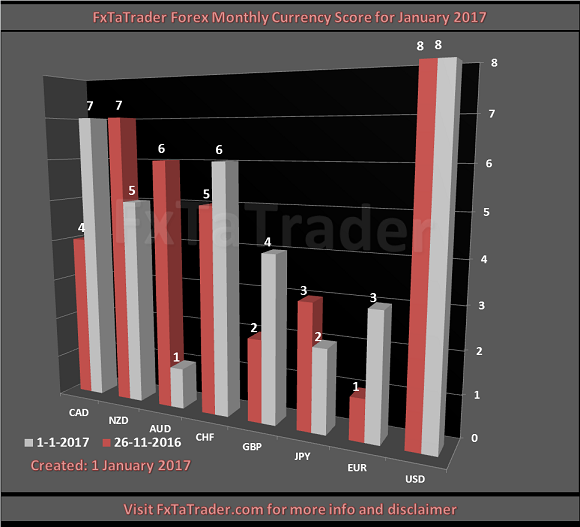 When comparing the 12 months Currency Classification with the recent Currency Score, as provided in the image above, we can determine the deviations. In the article "Forex Strength and Comparison" this is analyzed in more detail. Currencies with a high deviation seem less interesting to trade because they are less predictable. A good example at the moment is e.g. the CAD, JPY and AUD. Unless a clear opportunity based on the longer term is shown it seems best to be avoided. Besides this article I also use the Forex "Strength and Comparison" which is also available once a month on my blog. In that article we look in more detail at the relative position of the currencies and pairs. We will look in more detail at the interesting pairs from a longer term perspective for trading in the Daily and Monthly chart. We will use the information from this article, "Ranking, Rating and Score", and analyze it further in more detail. It is recommended to read the page "Currency score explained" and "Models in practice" for a better understanding of the article. If you would like to use this article then mention the source by providing the URL FxTaTrader.com or the direct link to this article. Good luck in the coming month.